We are living busy times! 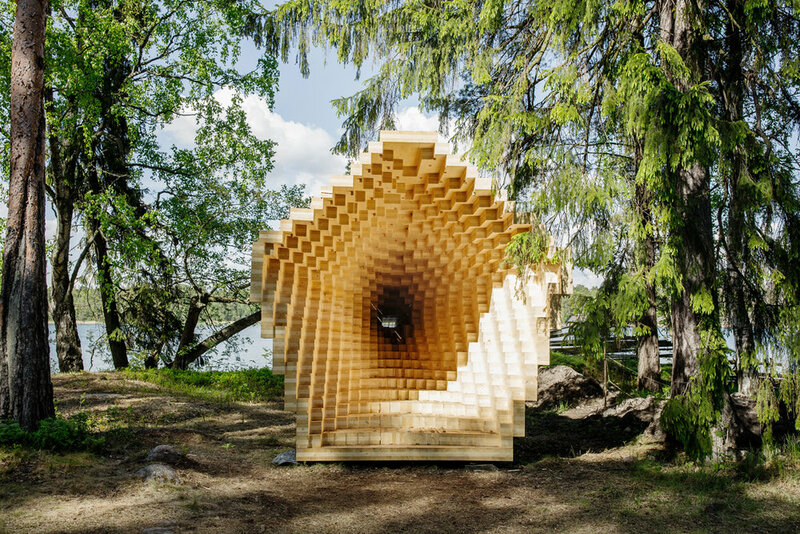 On Saturday 10th June, Miia-Liina will be talking about Participatory urban planning in the Nordic countries at the Nordiska Nätter festival in Helsinki. 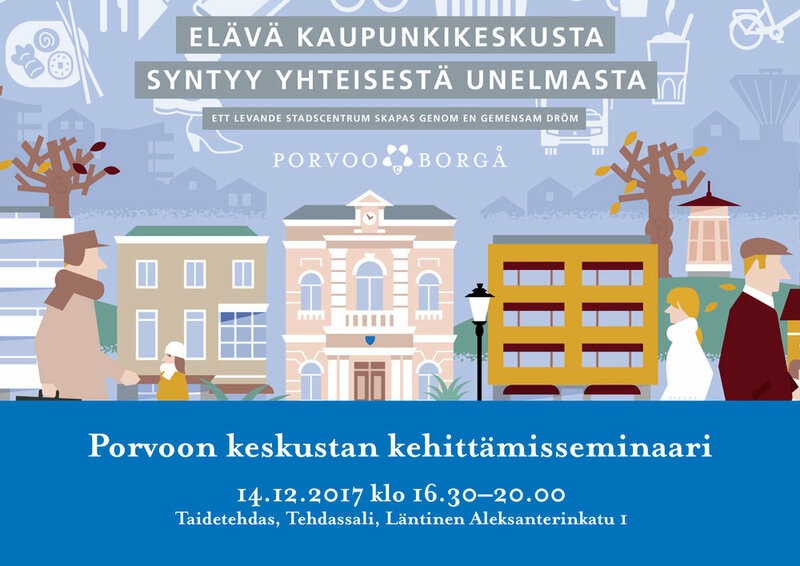 The presentation is held together with Heikki Riitahuhta from Studio Puisto Arkkitehdit, and the couple will be talking about their methods and projects as well as Uusi Kaupunki - the Finnish collective specialising in participatory urbanism. Get your tickets and check out the program here! We are looking forward to presenting ourselves and our methods tomorrow at the BAF Academy event for Bergen-based architecture offices. The evening is directed at young architects and students to give them an idea of what to expect after graduation, as well as to take a look at the breadth of practises in Bergen. However - everyone are welcome! Starting at 18h at Bergen School of Architecture, we are accompanied by MAD, Fortunen, Tippetue, Kvalbein and Asplan Viak. The evening is free and there will be tapas... so we are expecting a big audience! Details of the event at Facebook. Could the long term vision for Bucharest business districts be a more welcoming public space with focus on the pedestrians and soft mobility? In 2004 a group of economic geographers interested in innovation - Harald Bathelt, Anders Malmberg and Peter Maskell - defined the processes of interactive learning as a combination of ”local buzz” and ”global pipelines”. When local individuals, start-ups, and like-minded people locate in each other’s proximity, they are on their way to creating a local cluster (not necessarily a formal one), which is based on common interests, a particular field or simply geographical proximity. But for a local buzz or ideas to thrive, it also needs the ”global pipelines”, the strategic connection to the outside world, which allows for interaction, new ideas, openness and partnerships. Without the global pipeline, the local buzz runs the risk of stagnation, by missing out on the advantages of a broader collaboration. In a much less theoretical and rather more intuitive way, this knowledge creation process is exactly how Urban INC and Kaleidoscope got together to share experience which could be relevant to both parties and build upon knowledge and assets. Our exchange was gladly funded by the EEA Grants through the NGO Fund in Romania, as a follow-up to the capacity building of Urban INC in 2015-2016. This is rare opportunity for organisations working in Romania and Norway to meet and learn from each other’s different context and work experience. Our meeting point was using design methods to unpack complex problems which cities face. Our different approaches were the black box on our horizon, the opportunity to learn and experiment with strategies and tools which operate in a slightly distinctive way. At Urban INC, design methods translate into design thinking and complex problem solving, aiming at behavioral, policy and wider societal change. Kaleidoscope, as an architecture office, engages in participatory processes and user-centered design to address urban challenges through inclusive methods. Then there is, of course, the matter of local context, local institutions and the development path which impacts the tools and strategies one can apply in daily work. In our discussions, it was interesting to notice that participatory planning processes in Norway and Finland are not a given, but also something which professionals push for as a part of their work. In Romania, most urban problems translate into governance and wider development problems, in which it is essential to understand the need to build stronger institutions or the lack of incentives for public or private stakeholders to take more responsibility or be proactive. The starting point of our discussion was the Pipera and Dimitrie Pompeiu districts in Bucharest, a sort of elephant at a city scale. Why an elephant? Because even though altogether some 88,000 people commute daily to these two areas, closely located to each other, the infrastructure and mobility problems have not yet been dealt with. An estimated timeframe for the planned major infrastructure investments (subway extension, rehabilitation of tram tracks, development of bicycle lanes) has a medium to long term outlook, ranging from 2023 to 2030. On the shorter and daily reality term, companies and employees face the challenges stemming from the gap between public and private investment and lack of an overall plan: reduced accessibility and mobility, increased travel time to/from work, low quality routes for pedestrians, reduced public transport alternatives and limited parking space. These come packed with an impact on economic productivity, such as opportunity cost of time (in 2017, Bucharest went up five places to become the world’s 5th most congested city in the Tom Tom traffic index and Europe’s no.1 most congested city, surpassing Istanbul), difficulties in retaining labor force (if possible, it would be best not to commute to Pipera!) or relocation (to the center-west better serviced office buildings). Having undergone several processes of working with local institutions and stakeholders, at Urban INC we have come to a better understanding on the barriers to driving change. Apart from the weak institutions and the lack of overall incentives to do more or better, there is generally a lack of imagination for alternatives to what we have in front of us. For that reason, our purpose in holding a workshop using design thinking methods for Pipera and Dimitrie Pompeiu Districts was not as much focused on the results as on the process. The red line we curated and the “design thinking” checkpoints were there to make sure we have closed loops and managed to map problems which are widely known but not strategically communicated. Day 1 (3rd of March) was aimed for better understanding user insights and the problems perceived locally, by employees as well as employers. Apart from conducting interviews with local stakeholders, we wanted to observe directly the ways in which people interact with the space, so we undertook a long walk, observation and photography to guide us further on. For the second day (4 March), we invited a range of architecture, planning, design and local development firms to take part in a workshop in which we used our collective imagination to discuss the user insights we received from the area and to generate solutions. The process was interactive and we managed to capitalize on everyone’s super powers, as solutions generated ranged from short term tactical urbanism interventions to large scale infrastructure changes and investments. Interesting enough, a lot of emphasis in the discussion was on community building, on the needs to build an identity and commitment to the area, as well as applying a strategic approach in which small scale, guerrilla interventions precede a strategy and a long term plan. What can be done without lengthy municipal processes, and who should initiate change? What is the identity of the Pipera and Dimitrie Pompeiu districts, and how can the identified problems be turned into opportunities? These are some of the questions we wanted to highlight in the workshop held at Urban INC. It was evident from the interviews that social arenas, green elements and more outdoor activities would be highly valued. The opportunity to sit on a bench in the sun, have a place to meet a friend away from the shopping centre, or have a place to go for a walk in pleasant surroundings, or just being safe on the pedestrian sidewalk would give increased well-being and higher input throughout their working day. Understanding these people’s daily needs and obstacles is the key element in any further development of the area. The interviews confirmed the many challenges the area is confronted with, but also revealed possibilities and that people’s perception of the area is not solely negative. Many enjoy the modern architecture and the aesthetic of the lighted buildings, some do take their bike to work even though the bike lanes are few and incoherent, and although mostly located in the shopping centre, there are many eateries to choose from. But most importantly, there is an abundance of highly competent and resourceful people working in the area! This is the real asset. Walking through the area we also discovered several urban qualities, some more hidden than others. There is a diverse mix of modern glass buildings, former industrial buildings and wasteland. The new clean surfaces next to the old and ruff makes an intriguing combination, and some leftover green spots have a great potential. Being accessible from the center by subway, tram and bus pose a major advantage, and with small improvements and a change in mindset the area could turn problems into possibilities. Bicycle paths and pedestrian networks have an enormous potential to provide the area with increased coverage and improve the safety, health and well-being of those who work there. In addition, public spaces for social interaction could give the area a real boost, by integrating work life with social life and offer more than just being a workplace. The emerging business areas in the North of Bucharest have been growing fast and the local authorities have not proven the capacity to support this trend by putting in place adequate access to utilities or through master planning and long term envisioning. The administrative complexity of the city of Bucharest and its metropolitan area have also had detrimental effects in taking advantage of the private sector’s locational decisions and their benefits for the city. We have seen in our interviews and field research that governance boundaries translate into physical boundaries which come at great cost for the companies and employees who are key drivers for the city’s economic growth. However, we found there is potential to surpass existing challenges, if there is a clear understanding of the existing problems and opportunities, as well as an imagination of alternative scenarios. We found that design thinking methods can be a powerful tool to accelerate understanding and mapping of local problems and can provide a fast track to solution design. As a combined result of the different approaches and scenarios thought out in the workshop, Kaleidoscope worked out a series of collages illustrating one possible chain of incremental change. This scenario is linked to the power of renewal which is embedded in fixing the missing links in the area. 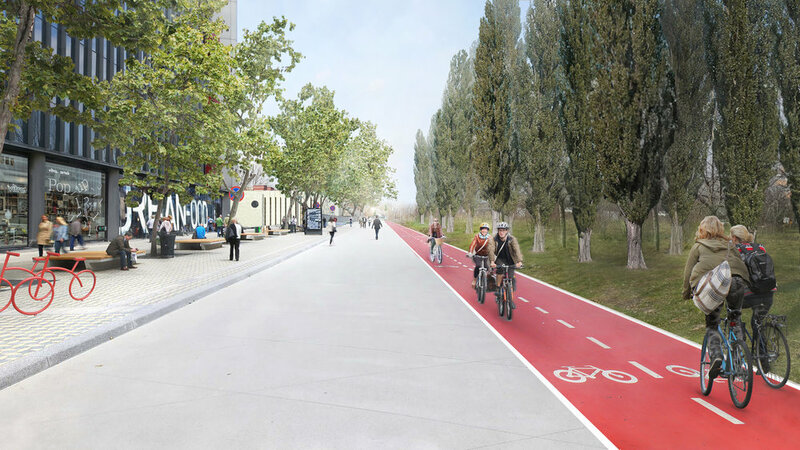 What if the short term action was only to remove obstacles and fences along the way, and paint a bicycle lane network connecting Pipera and Dimitrie Pompeiu district internally? Even in a guerrilla manner, in order to raise awareness around the conditions of public space? Could a stunt have the power to change people’s mindset and their behaviour? This immediate action could potentially function as a kick-starter for a long term vision where a welcoming public space with focus on the pedestrians and soft mobility rises as a new typology. The workshop was designed as a part of the project Urban Insights: Building partnership for user-centred design, financed through the NGO Fund in Romania via EEA Grants 2009-2014 and managed by the Foundation for Civil Society Development. The content of this material does not necessarily reflect the official position of the EEA Grants 2009-2014.